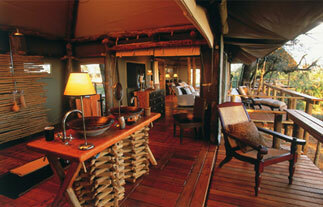 The camp has nine luxuriously furnished tents, raised off the ground. The guests' rooms and connecting walkways that connect are up to two metres off the ground, allowing game to wander freely through the camp - but at the same time allowing for guest safety. One often finds that animals take refuge under the rooms. The canvas rooms are spacious and well appointed and have en-suite facilities with an additional outdoor shower for those who enjoy a shower under the stars. The dining room and lounge areas overlook the open plain in front of the camp and there is a plunge pool for relaxing in the heat of the day. 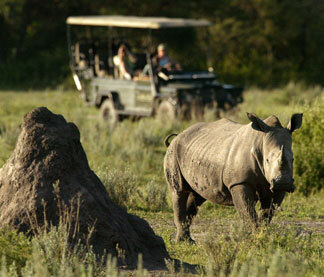 Activities at Mombo include morning and afternoon game drives in open 4x4 vehicles. 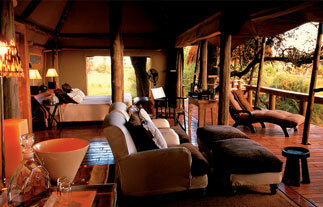 Mombo Camp Safari: The camp offers abundant big game viewing, arguably the best in Botswana. The highlight is the concentration of plains game and all the predators - including the big cats. Lion sightings are particularly good. Birdlife is prolific, with waterfowl and waders being particularly common. 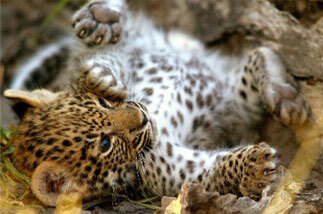 The excellent game at Mombo has made this area Botswana's top wildlife documentary location. National Geographic, the BBC and many others have filmed here. Moremi Game Reserve - Mombo Concession Mombo Camp and Little Mombo Camp are situated on Mombo Island, which is an extension of the north western end of Chiefs Island which effectively divides the Okavango into eastern and western sections. 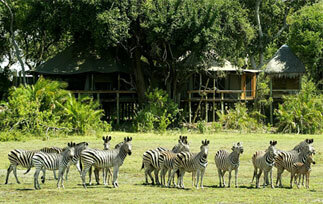 The whole of Chiefs Island and Mombo fall within the Moremi Game Reserve, and, in particular a zone within the reserve, set aside for "low intensity" safari use. Thus Mombo and Little Mombo are remarkably exclusive and remote. The sheer numbers and variety of large mammals in this area defy description, all year round. From elephant and both species of rhinocerous, to lion leopard and cheetah. From herds of buffalo to tiny steenbok, they occur in this area in large numbers. All this owes much to its position on the ecotone between the ancient Kalahari sands and vegetation of Chiefs Island, to the more modern, water borne sediments and grasses of the Okavango fan, to the west. Much geomorphological evolution has resulted in a richness and diversity that is legendary amongst the original tribesmen and hunters of the 19th and 20th centuries. The Moremi Game Reserve was amongst the first to be promulgated by tribal request in an effort to protect this fantastic legacy. They have certainly succeeded in the case of the Moremi. The annual inundation and drying of the floodplains to the west of Mombo, allow the large numbers of wildlife to utilise both habitats to the maximum. When the annual inundation of water arrives in the area during March to May each year, large mammals are able to move into the Chiefs Island area, which contains rich resources of grass and acacia forests. The wetlands are fringed by large hardwood trees, containing shade, cover, nesting areas, and food, for a wide variety of mammals and birds. By September and October the wetlands have started to recede leaving behind vast floodplains of short green grass when the rest of the large islands are at their driest. It is this seasonal food availability and quality that has resulted in the excitement and diversity that is the Mombo area.